I planned this, I really did. But it didn't happen correctly. Wrong move or move order and I was unable to recover. I bet you, dear reader, will not make the same mistake. Next move ? and continuation ? Honestly, it is really easy, the hard bit was seeing it before it arose ! 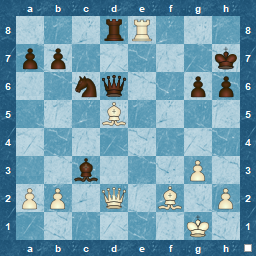 ...my favourite mate-of-the-moment, so here's something from the Chessbase site. I'm not sure I would find this over-the-board, at least not quickly. Initial move(s) are fine, but then there is a sticking point. 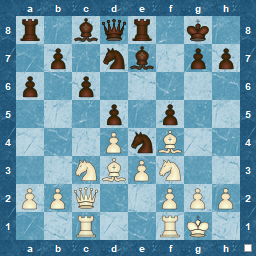 If you played the starting moves and hoped, you may well see it, but just visualising and calculating is a bit harder. 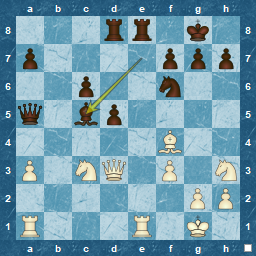 See the solution at Chessbase. I thought it best not to post another Arabian or Anastasia's mate, despite being in total thrall to the simplicity and beauty of both of them. Instead, a couple of combinations from rapid games. 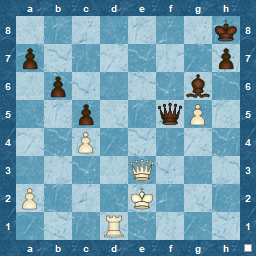 The first arises from the Centre Game, of which there are already a few examples on my blog. 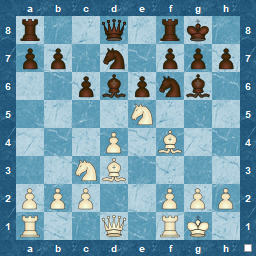 I started using it after reading an article, ,on the excellent chessvibes.com site some few years ago. It was written by Arne Moll who is, along with the editor, Peter Doggers, an entertaining and educational writer. 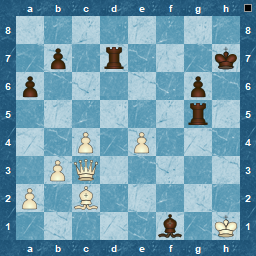 Returning to the Centre Game, the article in question used the Russian GM Ian Nepomniachtchi as a high-profile exponent of the opening in its modern form, with a rapid game against Aronian presented as the guide. 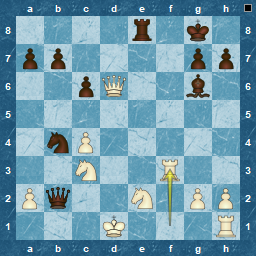 As an enthusiastic novice the Centre Game seemed a great way to 'get your own opening', since after 1.e4 e5 2.d4, the invariable response is 2...exd4, and Qxd4 puts you firmly in "your" opening :perfect , it must be a win ! Of course, nothing is so simple, since, quite naturally, Black doesn't want to play along with you. 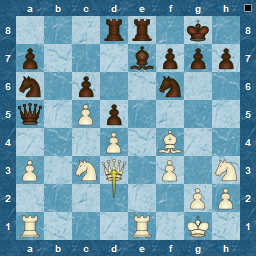 However, this gives it a psychological advantage in blitz, as, in my opinion, Black wants to show it isn't good, plus he wants to avoid white's preparation, and, as the Centre Game involves Queen-side castling as well, that is another beacon pulling Black to over-reacting ! 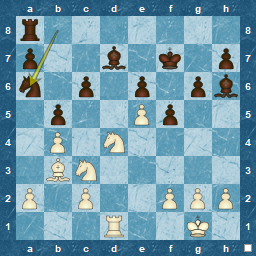 Below is the position I reached after a king-side pawn advance ( a typical plan and as always its rarely pleasant for your opponent to see a shieldwall of pawns advancing towards you). 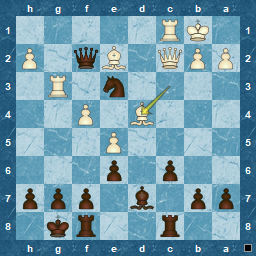 In this particular game,Black has also been lax in his weak defence, avoiding exchanges and blocks, retreating his king and ending up in a corner. Intuition just screams that there is a great combination here, and a minute's calculation convinces me, that victory is in sight. A different game and another combination, in this case not forced, but a nice example of showing how not only how an idea can be re-cycled, but also how one wrong move turns a level game into a winning one. 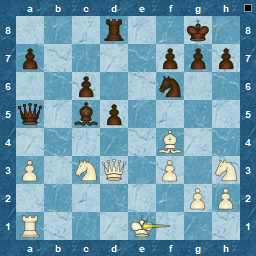 When I played Rb8, expecting Qe2 as a response, I had seen a promising sequence ( Nxc5, followed by Bc5+ and an exchange of Rooks ), but instead a very strong, maybe even winning response of Bf4 was played ! Oops, an overlooked and very nice pin. 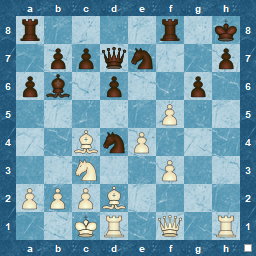 But Black's 17...Qa5 prompted the defensive 18.Qd2 from White, instead of the better Bxb8. I re-used my previous idea ( Nxc6, and Bxc5+ ) ending up here. 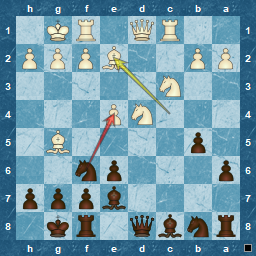 White responded with the bad move of Kf1, instead of Kh1. 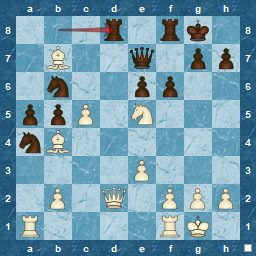 I assume he was looking at the loose pawn on the a-file, should the King-side Rook recapture after the exchange on e1. This isn't the losing move but it surely encourages it. 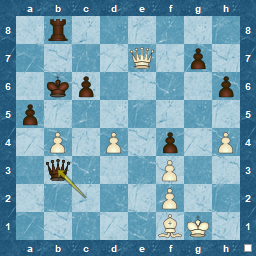 An exchange of Rooks, and definitely the wrong re-capture with the King, led White to resign. A game-winning pin, especially when combined with the winning pawn move of d4 ! 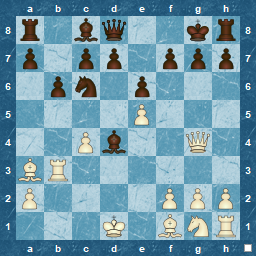 Something not from Chess Tempo for a change. This was part of a game illustrating King Safety. After the actual position (and lesson), the game continuation was given, arriving at this position where Black has a game-winning move. Satisfying, and a good move to find ! Recently, I discovered Anastasia's Mate ( as well as others, such as the similar Arabian mate). Of course, I mean I discovered how the pattern was named. Anastasia's Mate ( apparently named after a novel by Johann Jakob Wilhelm Heinse) involves Rook and Knight combining, often with a Queen involved. 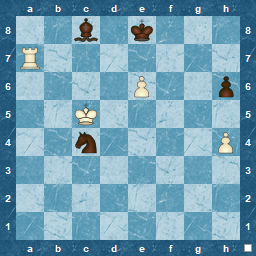 a Rook check, and the knight blocks the escape squares. Very neat. 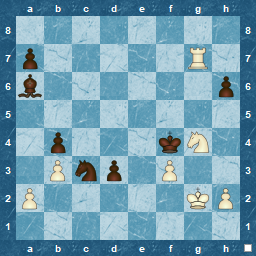 I must have remembered it well, as in the below problem, after dismissing the first move that came to mind, the knight + Rook pattern emerged. Its not that rare, as I saw a similar pattern later. The learning point is to know your mating combinations, as they do more than give mate : the mate threat can be devastatng ! My continued practice of tactics, mainly through the use of Chess Tempo, appears to be paying off for me, despite the difficulty of measuring this precisely. I find that I can calculate better, and that I see more ideas. However, wanting to be confident that I have the correct solution often means that I spend more time than 'the average', which isn't bad per se ,as it means I am re-examining, re-calculating and probably reinforcing positions and variations that I see : extended practise, so to speak. It does mean that I look at fewer problems/positions per session though. 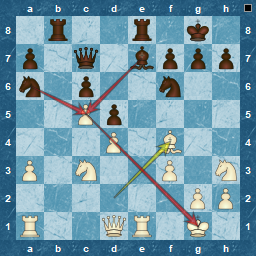 I notice this is in OTB play as well : thinking too long, I tend to fall into time-trouble towards the end, often being 15 minutes behind my opponent, which naturally increases the risk of mistakes. Lack of time is not always helped when I forget to stop my clock, since opponents ( especially in League matches ) will rarely remind you. 90 minutes with a 15 second increment sounds like a huge amount of time, but it can be eaten up very quickly. 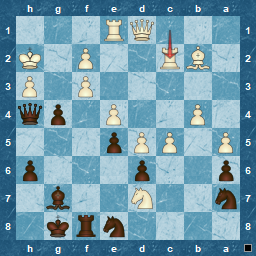 In a recent game, I was a pawn up, I still had to win it, and it didn't look that simple when you have about 9 minutes to the opponent's 15. 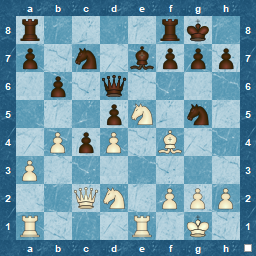 Eventually, after my opponent also burned time thinking, pushed the king-side pawns aggressively and gave me an opening, I ended up in the position below. 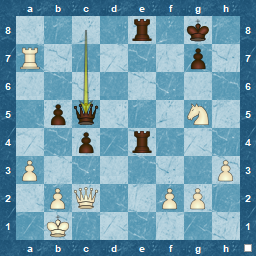 Easy to win, I'm sure you will think, but with about a minute left, and with the Black King in front of the doubled pawns it looks daunting. 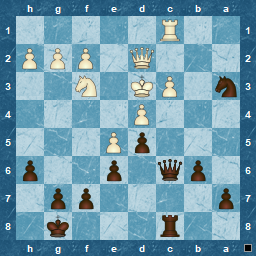 In reality, once I had decided on a plan, I just played quickly for 6 or so moves gaining time on the clock, and with a mistaken Kh8 from Black turning up, I could stop and spend some time to make sure of the win, and even more importantly, avoiding the stalemate ! 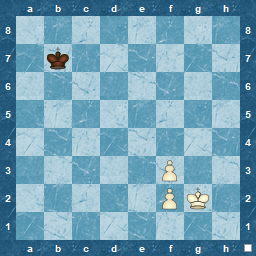 Finally, just to show I can still fail miserably, I spent about 5 minutes staring at the following before making the wrong move. I just didn't consider the White response fully, but it was nice to have the correct idea ! I managed to creep over 1700 at ChessTempo. In fact ,I achieved this earlier in the year, but then, even though I kept above 1700 for some time, I hit a very variable streak, rocketing up, but just as quickly dropping back to almost 1600. Its taken me a month to edge up to within 1700, but somehow just not quite making it. However, re-focusing in the last week has allowed me to regain the last of those 100 points to go over that 1700 limit again. In the process, I have managed a continuous 42 weeks of problem solving, and have just completed 89 consecutive days as part of that. Technically, the number of days is almost double, but a software glitch linked to a being in a different time-zone cost me a missed two days. Below is the problem that took me above 1700 ( to 1700.9 to be precise ), and it is a satisfying one. 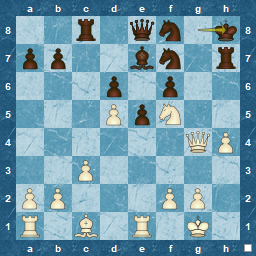 The pawn, Knight and Rook combine to suggest a confinement of the King, but is there enough to force a mate ? That is the question to be answered, and although it took me more than the average of 6:20, I found that the answer was "Yes", and proved it. 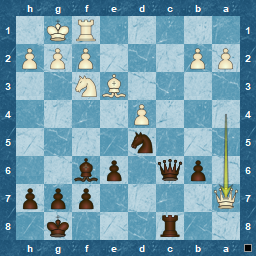 To show that pride does indeed come before a fall, the below diagram shows me as over-confident, assessing both the solutions I had found, but through a lack of proper calculation and blindness, over-looked an obvious Black response, chose the wrong move, and dropped nicely under 1700 again. Now, though, I'm back above the line and on a slow and steady upward course. 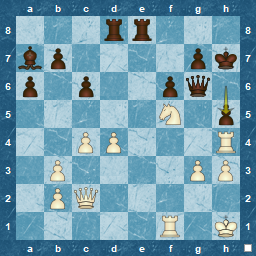 To swap Queens or not ? I was distracted during this rapid game and lost focus and the exchange. A few moves later I was back in it due to his inexplicable ( to me anyway) decision not to re-capture a piece. This gave the initiative back to me and I went for the king, but he had some dogged defensive play and we reached the below position. I'm ahead on material, so my initial response to Qe5 is to exchange and simplify, but after all the tactics puzzles I do, there must be something on offer ? Here's something from the past, 1930, San Remo to be exact. Sometimes, in problems like these I can see the the target but not always work out the way to reach it. This was the case here. There are some instant targets available, but if, like me, you focus on the wrong target initially, it can take a while to re-orient to the real one as you just keep trying to make it happen. Sadly, although I saw the motif, I took an alternative path to achieve it which was not as sweet, but proved effective. Although this is a "what to play?" problem, its also great to practice calculation, at least in my opinion. 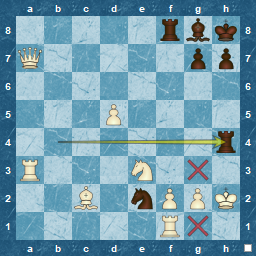 I did not calculate correctly, at least on this move, but since my opponent mis-calculated two moves later, and with far worse consequences, I went on to win. Its also interesting to skip a couple of moves before this move, as that was probably more balanced and white's choice dis-advantaged him. 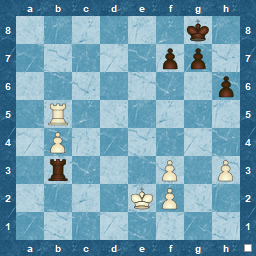 White to play : Win or draw ? This turned out to be the key point of a long game. 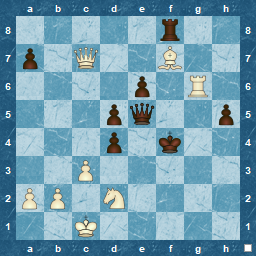 A topsy-turvy game featuring a mis-calculation fron me, followed a few moves later by a mistake from my opponent, leaving me materially ahead. However, here, I had a decision to make. What would you do ? Winning or drawing decision ? Regardless, it was a great game ! Looking back at the blog, I note that its been a good month since the last post, deferred, no doubt, because of work, life and other things too obvious to mention. 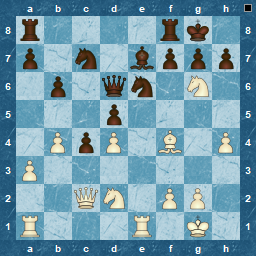 I've not been "chess idle" in this period with time spent on chesstempo tactics, Team League and some blitz to keep me occupied, as well as that thing called Christmas and the New Year ! 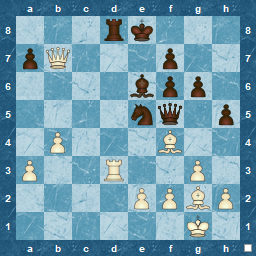 Below is a position from a recent blitz game, starting off as a Bogo-Indian, but not really following theory much. 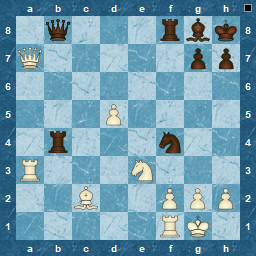 White played a few strange king moves after move 12, in my opinion to gain time and just see how I would react. It allowed me to whip up much Queen-side activity and reach this position. Sadly for me, the 'phone rang. On answering and knowing I had to chat for a while, I felt obliged to offer a draw ( which was accepted ) rather than let the time run out. In fact, it was a cast-iron win for Black. Doesn't matter what White responds, Black is much, better !